(AP) NEW YORK - "Who am I to say I want you back? When you were never mine to give away." Those are the opening lines of a song that accompanies a "New Myspace" promotional video. The once-mighty social network is trying to stage yet another comeback with the help of Justin Timberlake. The new site, for which people can request an invitation, looks a bit like an entertainment-focused version of Pinterest, with a dash of Twitter and Facebook (FB) thrown in. But Myspace has tried redesigns before, to no avail. Will it work this time? "If you break my heart a second time, I might never be the same," continues the song, "Heartbeat," by the group JJAMZ. From the sound of it, Myspace wants to win the hearts and minds of tech-savvy hipsters. Founded in 2003 and initially a fast-rising star, Myspace attracted mostly teenagers and twentysomethings, offering them a place to express themselves online. It peaked in 2008 with some 76 million U.S. visitors in October. The site lost its footing as the fun of customizing profile pages began to bore its users and the site's heavy use of banner advertisements slowed the speed at which pages loaded. At the same time, people were already migrating to Facebook, which counted users 35 and older among its fastest-growing demographic. The company's new promotional video offers a 2-minute and 18-second peek into a slick, image-heavy site. The site's much cleaner look is a stark contrast to the old Myspace, which users often derided as messy and cluttered. Posted this week, the video promises that Myspace will start "totally from scratch," as if trying to shed its former self. It doesn't say when the new site will launch, only that it's "not ready quite yet." The new Myspace will let users connect to the site with their Twitter or Facebook accounts, a sign that it won't be competing with those sites as a social networking service. Rather, Myspace will continue with its entertainment focus, as a place to play and discover music, add photos, videos and playlists and connect with artists. Timberlake, who's featured prominently in the video, will likely play a big part of the MySpace revamp. The former 'N Sync pop star, with a group of other investors, bought MySpace last summer from News Corp. for $35 million, mostly in stock. That was quite a difference from the $580 million that News Corp. () paid for the company in 2005, when it was still an Internet darling. 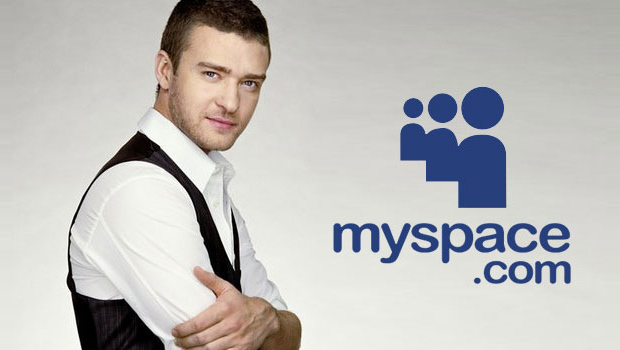 MySpace, of course, isn't Timberlake's first foray into social networking. He played Napster co-founder Sean Parker, a party animal and early Facebook adviser, in Aaron Sorkin's "The Social Network" in 2010. In August this year, research firm comScore put Myspace's monthly unique visitors at 28 million, making it the 43rd most visited Web property in the U.S. It's behind the likes of not just Google, Facebook and Twitter but startups such as Tumblr, along with the reviews site Yelp and WebMD. "The new design certainly looks beautiful and it could certainly spur a lot of initial interest," said Clark Fredericksen, spokesman for research firm eMarketer, which used to put out ad revenue estimates for MySpace but no longer does. "But there are going to be significant challenges for any company looking to enter the digital music space. You have a lot of entrenched players who are really successful." Those players include Spotify, Pandora, Rdio, not to mention Apple Inc.'s iTunes. There's also the mobile question. It's unclear from the video what plans the new MySpace has for mobile devices such as Android smartphones, iPhones and tablet computers. Fredricksen points out that cloud-based music - streamed over an Internet connection - is shifting toward the mobile platform primarily. We are all on the go with our music. MySpace is entering a crowded market here, too. "Maybe I'm ashamed to want you back. Maybe I'm afraid, you'll never stay."